Morris has been producing farmer-inspired agricultural equipment since 1929. Starting from a single garage in Bangor, Saskatchewan, the company expanded to serve growing regions around the world. George Morris officially started making farm implements in 1924. Just before founding Morris, he created the world’s first “automatic trip” — a device that automatically avoids rocks and field debris, resulting in less repairs and downtime. This innovative thinking set the stage for decades of game-changing technology that expanded Morris’ influence as far away as India, Russia and Australia. Over time, several newer and seemingly more innovative companies had all-but taken over the industry. What the global market didn’t realize in 2018 was Morris was on the verge of a complete reinvention of itself — including the release of the game-changing Quantum air drill and ultra-secret ShieldCore welding technology. 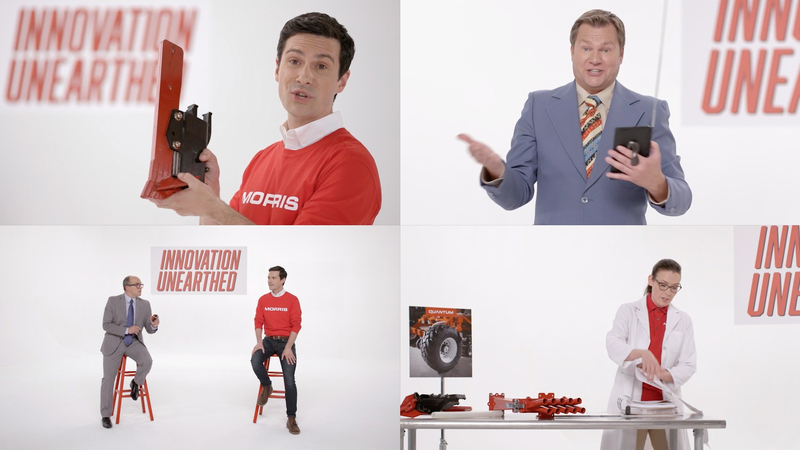 To announce this new era, Morris needed a marketing solution as bold as their vision for the future. With so much on the horizon, we knew our task was bigger than just a new campaign. Morris needed a fully featured creative platform that could support a wide range of initiatives for years to come. Our solution was “Innovation Unearthed” — two words that summarized the company’s past, present and bright future. While the rest of the industry focused on specs and product shots, WS took Morris in a completely different visual and emotional direction. Innovation Unearthed started a new conversation with a whole cast of characters; including a real weatherman, the proud voice of R&D, a lawyer who could barely keep up with the company’s patent applications, and a fresh face for Morris himself. Our in-house Analytics found the agricultural community was surprisingly active online, so for the first time ever, Morris focused on social media and digital advertising. Online tactics allowed us to track and report on KPI results in real time through our WS dashboard. This proprietary measurement tool opened up a whole new world for Morris, with exclusive metrics, sales avenues, and engagement opportunities. Even before the results were in, Morris knew they were never going back to their old way of advertising. Once the campaign was in full swing, Morris was able to unearth innovation both on and off the field in a number of new ways. Our analysis looked at what the campaign did to build awareness, gain acceptance, and drive action. In the first three months, the campaign covered the target market with a multi-channel approach gaining nearly 2.5M impressions. The awareness KPIs were set to indicate an increase in traffic to Morris-industries.com — specifically for organic traffic. Over this time, traffic grew by 32% and organic visits grew by 21%. WS set a KPI of over 4,000 visits for the campaign’s landing pages. The KPI was exceeded by 33%, attracting 5,320 unique visitors to the landing pages in the same three month time period. Our team also set an aggressive KPI for growing Morris’ database, which we beat by 4.50%. Understanding the social habits of the audience was also a huge payoff. Our team built a strategy around paid social ads and organic social content which gained 70% of signups from social. The lead nurturing strategy included personalized email and content. This strategy generated more than 4,700 pageviews in three months. The email open rate was 55% and click-through rates were 16% — which is especially impressive compared to the industry averages of 25% and 3% respectively. The campaign’s three pre-roll video elements also saw above-average results with a view rate of 58% over the industry average of 28% for B2B companies. Note: view rate is found by taking the number of views or engagements the video receives and dividing it by the number of times the ad was shown. This shows how many times the ad was seen instead of how many times it was watched. It’s just one of the important differences we look at to find more meaningful client data.